Restaurant Day is the world’s biggest food carnival and happens worldwide four times a year. In the past Restaurant Days all together over 17 400 one-day restaurants by over 70 000 restaurateurs have catered for estimated 2 million customers in 70 countries. Restaurant Day is a carnival of food. 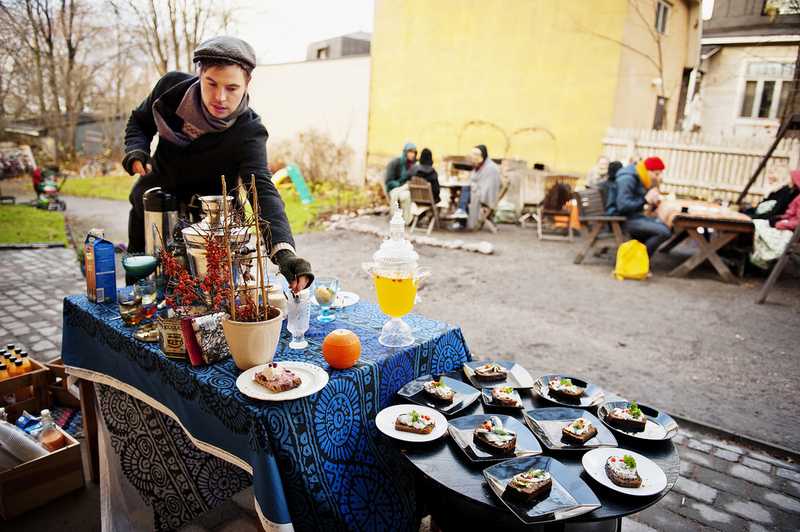 Four times a year local residents in Helsinki get together to have fun with food. Restaurant Day lets anyone become his or her own restaurateur for a day. Hundreds of popup restaurants appear throughout Helsinki – and dozens of other cities in Finland and abroad. All you have to do is sign up on the Restaurant Day website and get cooking – it is that easy! The real heroes of Restaurant Day are the thousands of fun loving people organizing and visiting amazing one-day restaurants. However, a tight and active group of volunteers is needed to make sure everything runs smoothly in the background. The event is facilitated by an association created by the Restaurant Day team. The members of board are Timo Santala (Chairman of the Board), Kirsti Tuominen, Antti Tuomola and Jyrki Vanamo. The initiative is based on food design, but it also promotes other kind of design practices, such as space design, furniture design or services design. Service based design: the idea behind Restaurant Day arose from frustration over all the bureaucracy involved in running a restaurant. Wouldn’t it be great if for just one day anyone could operate their own restaurant with no bureaucracy whatsoever? Three friends, Antti Tuomola, Olli Sirén and Timo Santala, came up with the solution. “We brainstormed the idea and thought of everything Restaurant Day could be. Antti and I set up a bike bar to sell drinks and tapas, and at the same time we encouraged others to join us,” Timo Santala remembers. Over 38,000 restaurateurs have operated the popup restaurants, and they have served an estimated 1,000,000 customers. Restaurant Day is certainly helping to boost the images of Helsinki and many other cities four times a year.